Rick, possibly the last known Penguins fan to hate Rob Scuderi, returns for his take on the Instigator Rule. Let him have it in the comments. retribution for a previous incident in the game or season. Like most people, I enjoy the physical aspect of hockey. I like to see big hits. I also like to see a teammate stick up for a star player when they get knocked down. More often than not it involves fighting. I know the NHL wanted to crack down on thugs when they started using the fight instigator penalty, but I believe this has played only to thugs' advantage. Take Sunday's game. Cote, a 4th line scrub, puts a big hit on Sykora. Malone comes over to address the situation. Maybe he was going to ask Riley if he wanted to get a sandwich, or even question whether his head had healed since BGL gave him a pounding earlier in the year. More likely, he was going to challenge Riley Coyote to a fight. Ryan, being a smart hockey player, didn't want to draw an instigator penalty and kill the Pens' momentum. As he approached, Riley Coyote reached into his ACME bag of tricks and took Ryan to task before Ryan could get his gloves off. 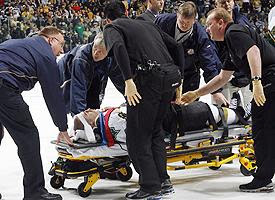 Luckily, Ryan got down in a hurry, and wasn't injured, but imagine if he would have been hurt for a playoff run all because he wanted to avoid a fight instigator? NHL, the fight instigator makes less sense than the 8 games you gave Chris Pronger. Look at these three incidents. All involve a pure jobber: Tootoo, Weller, and Cote; a hit on an established teammate: Modano, Nash, and Sykora; and a role player sticking up for them: Robidas, Tollefsen, and Malone. All three were pounded as a result of wishing to avoid an instigator. In none of the cases did the charging party get his gloves off before a head shot was thrown. Malone wasn't hurt, but the other two received concussions. The tape speaks for itself: the fight instigator needs to be reevaluated. Didn't those goons get instigators for throwing those punches then? But I agree. Part of the game is guys sticking up for one and other. You don't have to make it so the little guy has a better shot, but you shouldn't put him at a disadvantage going in. The whole point is the three guys who wound up taking pounding tried to avoid the instigator. (The jobbers may have ended up with them due to the muggings.) Nonetheless, had they not been trying to avoid it, it may have been a fair fight.